But that ship set me thinking. 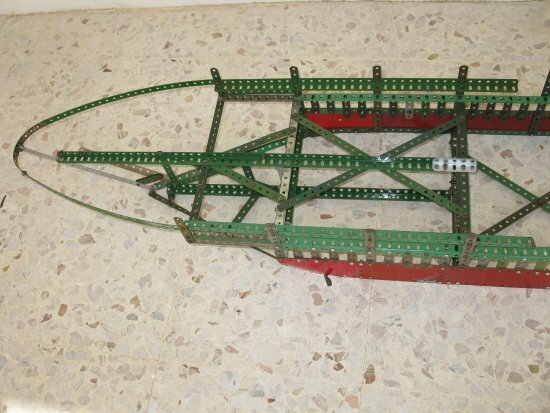 I had never built a meccano ship before, and that one was obviously a joke. What about a proper ship? With all the details? And what kind of ship? A warship? 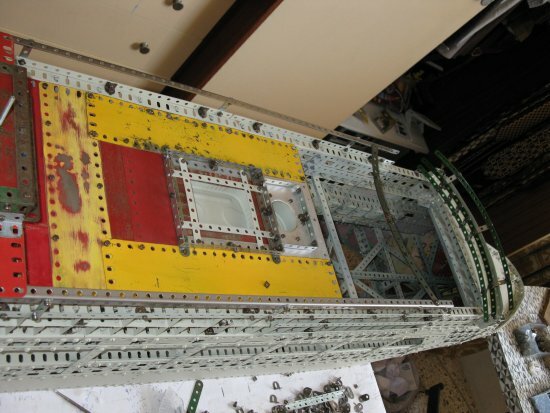 We often bemoan the fact that a lot of us keep building models of obsolete prototypes, like steam locomotives and engines, trellised bridges, old buses or cars, etc. 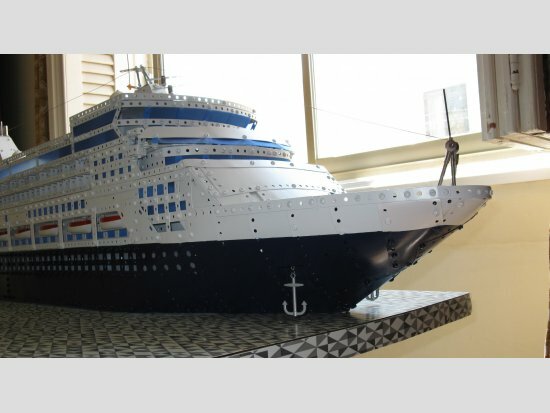 So my ship would be a model of a modern ship. But what? A modern warship? And then inspiration struck. What is more modern that a modern cruise liner? Not the Titanic, for heaven's sake, but something like the latest Queen Victoria, or the Norwegian Epic. But these ships, with their multitude of decks, and special features, are too complicated, and would require a year's work to reproduce faithfully. Now, I wanted my model to be an exact replica in all respects: in shape, in proportion, in colour and in scale. So the first step was to establish a scale for each cabin. I was going to reproduce ALL the external decks and cabins of this ship. I chose a scale where two holes would represent a cabin. This gave me an overall length of 6'7" by 10 ½" wide. So on March 24, I bolted the first parts together, fully expecting the ship to be ready by end June. I will state at the outset that there was to be no pussyfooting about cutting strips and plates to size and shape. I was after the correct shapes at whatever cost. 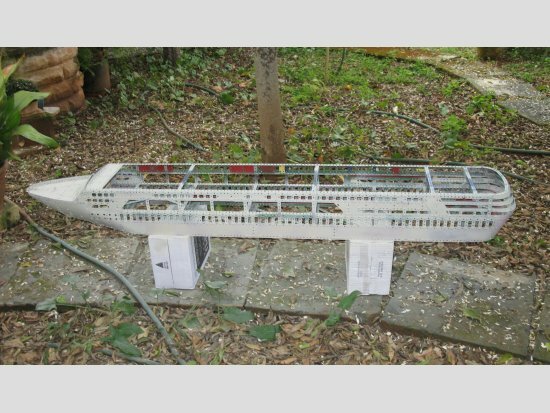 The ship consists 99.9% of meccano. No exotic machine tools were used. A hacksaw, tin snips, and a rat tail file were all the tools I used. I know that there are respected meccanomen who disagree with these methods. Normally, I try to avoid mutilating meccano parts. But this ship was not destined to be dismantled, and its components will not be reused (at least, not in my lifetime!). Meanwhile, work continued apace. By the end of March, the straightforward lower midsection decks were done. The stern was slightly more challenging. Obtaining data proved to be impossible. The only dimensions I ever got were the overall length and breath. Not even height. This had to be worked out from good pictures downloaded from the internet, and from having a good idea of how high each deck really is. The bow proved to be more of a challenge, but eventually this was overcome. Unfortunately, a number of perfectly good 7 ½" strip plates had to be sacrificed here. Nothing is powered on my ship. It is intended as a static display. 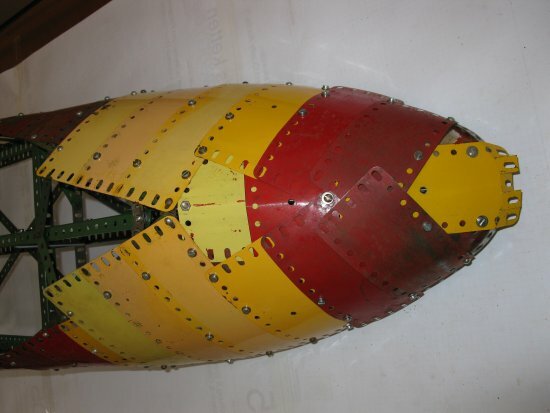 Putting in motors on a model which is not to be dismantled would have entailed too high a sacrifice. And I reckon that presenting a realistic liner in red and green, or yellow and zinc, just would not do. Meanwhile, work went on, and by the third week of April, the ship had advanced to the upper promenade deck, and had received its first coat of undercoat (that doesn't sound quite right!). I used aluminium sheeting to achieve the compound slanting curves at the stern. I would honestly like to see those realistically reproduced using 'standard' Meccano. The primer is in fact putty filler. I was told it could handle both painted and bare metal. It also filled in the roughly sanded parts nicely. The 0.5mm thick aluminium came in 100mm wide rolls, and some remnants had been lying about in the garage for the last thirty years! The upper strips, when flattened out, were blunt-ended crescent shaped, and had to be cut from material at least 3" wide. Keep in mind that the straight and vertical sides gradually merge into the curved and slanting, rear. My maths is not good enough to enable me to work out the shape theoretically beforehand, so I bolted wider parts and marked them off parallel to the waterline with the improvised device shown in the photo. To a point, cruise liners do look alike. Most of them (not the latest super giants) are made to go through the Panama Canal, and the flat sides are dimensioned to fit. But they all have different characteristics, especially in the superstructures. One common feature is that, increasingly, they are tending to include more and more outside balconies. On this model, which was going to be overpainted, I was not worried by the possibility of rust coming through in some years time. Ships rust and are repainted! I gave rusty parts strips and girders a not-so-thorough but good rub with emery cloth. The not-so-rusty plates (whether red or yellow) only got a superficial rub, just enough to remove any rusty spots. I was to regret that later. 4th June. Swimming pool and Jacuzzi safely installed after testing for leaks. Attention is turned to the bridge area. 16th June. The skydeck, and mid section deck over pool, are in place, though the top railings are later to be replaced by narrow strips. At the ship's scale of 1:110, narrow strips represent a height of about 38", which is about right for railings. 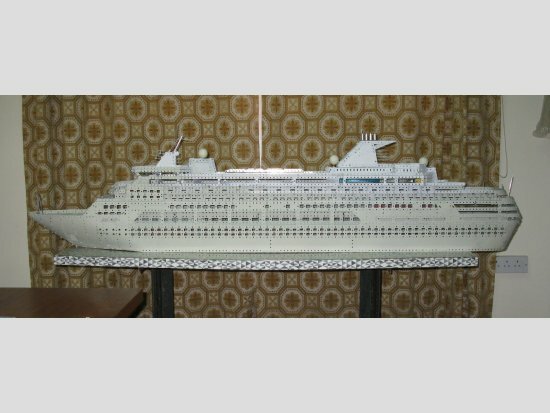 It was decided to use narrow strips throughout the ship to represent all railings. Unfortunately, I did not have any long narrow strips, and 36 of 12.5" had to be ordered from a certain Lord in the UK. The lovely green paint was scrubbed off, for eventual repainting. On the 28 June, after much cutting and filing, the sliding pool covers were ready. These, like the supports for the top deck, were made out of stainless steel narrow girders and zinc narrow strips. I had acquired 16 no. 24.5" narrow girders at Skegex in 2000, and never used them. Alas again, I had to cut up 8 of these. Another sacrifice. 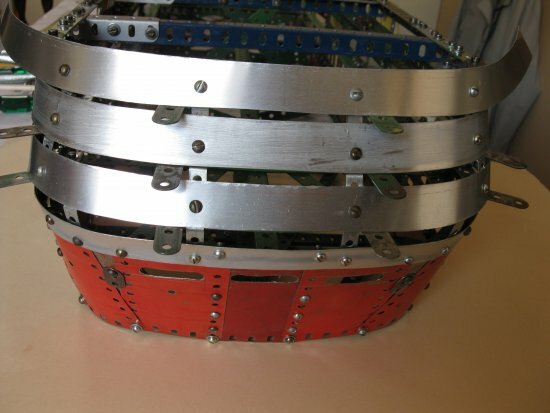 This latticed cover is the only part of the ship to retain an original Meccano finish, at least so far. I am not sure if it jars or not in the finished model, and eventually I will ask for your opinions. Unlike the complicated extending ladders produced by George, Guy and others, these covers just slide on each other, and are comparatively simple. The ship is not designed to roll enough to dislodge them. They were not mechanized for reasons stated previously, i.e. I was not prepared to put any motors in the ship. But I assure anybody that they can easily be opened and closed manually! Finally, on 1st July, construction was ready, and the ship had received an entire coat of undercoat. You might notice that the upper levels are a lighter colour. The German undercoat which I started with was out of stock, and my suppliers gave me some other substitute. This was the making of the second painting headache, as it was nowhere as good as the one I started with. The communication spheres should be about ¼" larger than a table tennis ball, but so far I have not found any locally. It should now be easier to identify the ship. The white spray would not entirely cover the red plates which I had failed to rub down to the metal. The red hue kept coming through, no matter how many coats I applied. The latter lot of undercoat was inadequate, and adherence of painting on top of it proved to be very poor. I had to rub a lot of places down (very difficult with bolt heads and in corners), and redo. The model was to be finished in three main colours. The lower hull presented no problem with the dark spray paint covering well. 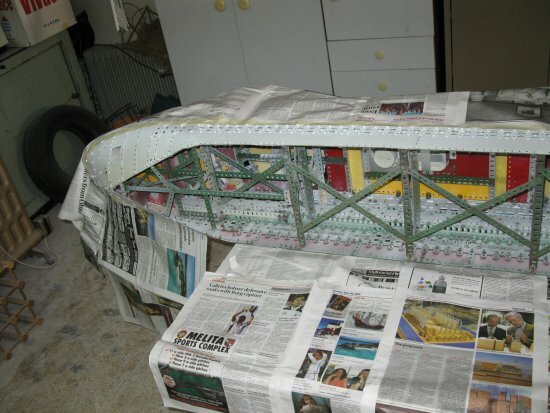 The upper hull in white spray was more difficult, but luckily the green strips and girders, even though not thoroughly rubbed down, covered well. All the horizontal decks were hand painted in a teak like hue. Cover was very good, but my patience was stretched to the limit in avoiding spoiling the already sprayed white sections. The swimming pool areas were similarly hand painted in light blue, and the four ventilation outlets were trimmed in black. 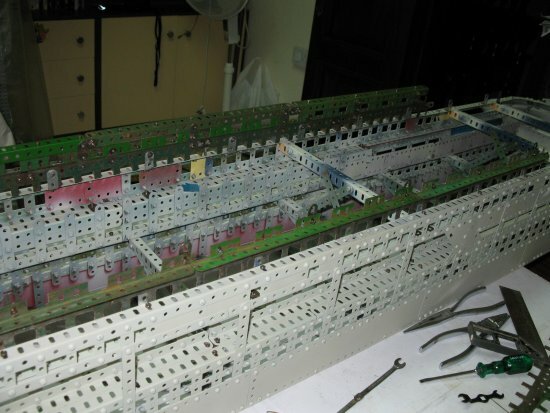 I had to do a lot of dismantling during the painting process. After reassembly, all bolt heads involved were retouched up again. 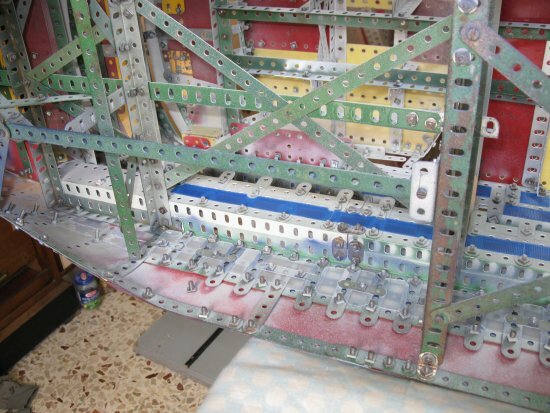 My advice is never to spray a finished meccano model in more than one colour. Unless you mask off all holes (which is nearly impossible in a model of this size), overspray will come through, and spoil your already nicely done areas. Finally, painting was finished by end July, and the model was ready for the next process. I forgot to tell you that I decided to glaze all the openings on the ship, as per prototype. We could not afford to have peeping toms piling at the portholes! (the openings gave an unsightly view of the insides). Both the opaque white, and the ribbed blue plastic was cut off stiff plastic file covers. About 600 openings were glazed either individually, or in blocks of three or four, depending on the nuts' position on the inside. The two sides were glazed from the inside, but this proved to be impossible in the inaccessible spaces of the bridge and stern, and these were done from the outside. This super gluing process took over a week. A final photo, showing the central swimming pool, with covers open. The ship is practically finished, and the lifeboats were hoisted in place this morning! The real ship has 8 lifeboats and 4 larger cutters used to ferry people ashore in ports where the ship cannot berth alongside. There are also about 16 life rafts on each side, stacked two deep. Fact is I ordered more model life rafts, but the only had ten in stock. Not that I can fit sixteen each side on my model. When I give away the name of the ship, all the statistics could be obtained from the internet. On the 17th August, the ship was ready, with the lifeboats finished and fitted in place. The model is 6' 5½" long, 11" to the top deck, 17¼" to the top of the chimney tubes, and 10½" wide. Time to reveal the prototype. It is the MS Ryndam of the Holland America Line. Actually, it could be any of the other sister ships, Statendam, Maasdam, and Veendam. They vary slightly in superficial features, but are essentially the same. 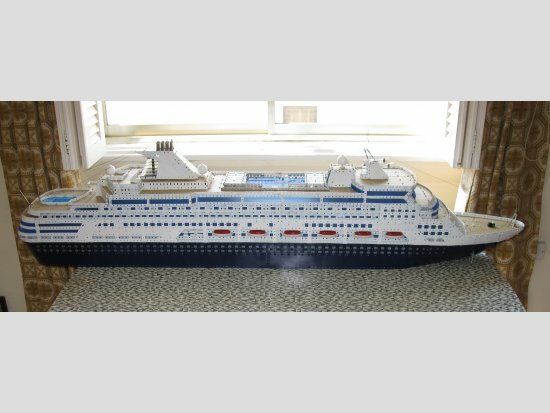 In fact, the attached picture, which served as my master plan for the model, is of the Statendam, but I prefer to name my ship Ryndam, simply because I had travelled on it. I downloaded dozens of photos of these ships, and they offered me a good insight into various parts of the ship. Spanners may like to Google Ryndam (Images) for comparison to the model. Four people guessed which ship correctly. Glyn Roberts, closely followed by John Stark, guessed on the 18 August. Followed later by Rod Fewings and Mike Dennis. Les Megget guessed correctly the Shipping Line. I hope I have not left anyone out. Text and photos are © Joe Attard 2009. All rights reserved – if you wish to use them place a question below. 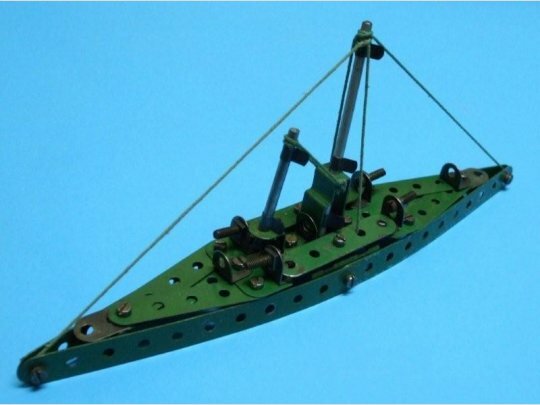 Excellent model, it looks right from all angles, even those awkward 3D curves of the bow and stern.